‘Tis the season of giving. Or if you love cannabis…ganja giving! But what do you give the cannabis lover who has it all? 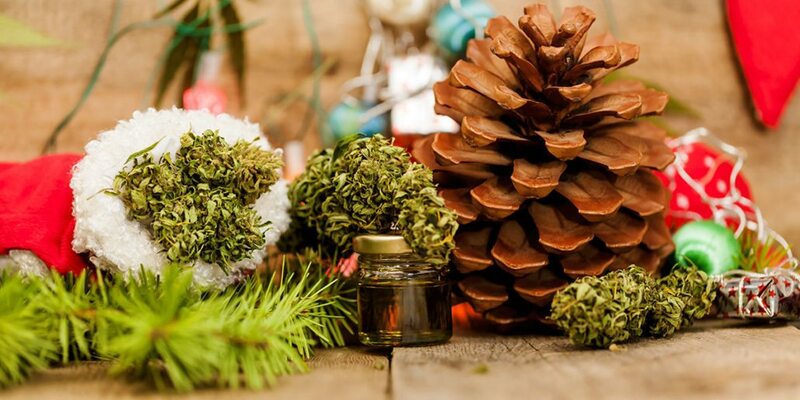 Here’s a list of the top five Christmas cannabis gifts that marijuana aficionados are sure to go crazy for! Christmas isn’t Christmas without cookies, and for this occasion, Dutch Girl Cookies are the perfect stocking gift. They go great with a cup of coffee in the morning, or you can munch on them during those cold evenings when things are finally winding down. After all, why should Santa be the only who gets to fly high on that special night? Plus, if you swing by Essence’s Henderson and West Tropicana locations on Christmas Eve (12/24) and purchase a package of Dutch Girl Cookies, you can get a second one for just $1! The Rove Vape Pen is a sleek, discreet, and elegant solution for people who love cannabis but don’t love all that smoke in their lungs. The cartridges contain only premium CO2 cannabis oil, terpenes, and natural flavors, and the pen is specifically designed to break up any clogs that might occur. Purchase a select Rove cartridge on Friday 12/22 at Essence, and you can get a select cartridge for $1. Don’t forget to pick up a battery as well! At some point, all you’re going to want is just a minute to yourself to kick back and actually relax. Well, the Dixie Synergy Balm and the Cannabella Muscle Relief Salve can help you do just that. This balm has an equal ratio of THC and CBD, making it a powerful tool in the fight against chronic pain, inflammation, and neuropathic conditions. Other beneficial ingredients include cacao, rosemary, lavender, and pine. In addition to cannabis, this salve contains a blend of coconut and beeswax oil as well as essential oils like camphor, wintergreen, blood orange, and cypress – all of which will warm your tired muscles and joints, relax them, and treat any inflammation you may be suffering from. Las Vegas is a dry city, and when you live in the desert, moisturizer is a must. Sure, you can go for regular, run-of-the-mill lotion, but – better yet – you can surprise your loved one with one of these cannabis-infused lotions. Cannabinoids have both antioxidant and anti-inflammatory properties that can give your skin a much-needed power-up. And because the cannabinoids are absorbed directly into the skin, they won’t enter your bloodstream and make you high. Sometimes, the best gifts are the simplest ones, and you can’t get any simpler than high-quality cannabis flower. You can give the person your favorite strain – the one you just can’t stop talking about – or you can give them a selection of pre-rolls as a kind of “sampler plate.” It’s a great gift for both novice and veteran users! Need more ideas for Christmas cannabis gifts? The “12 Days of Essence” holiday special is still going strong, so check out the deals below and come visit us!